Law enforcement professionals are key gatekeepers in the National Strategy for Suicide Prevention. Learn what you need to know to protect your co-workers, friends, family, and community. The official description of this best practice registered course can be found at: http://www.sprc.org/sites/sprc.org/files/bpr/QPRLE.pdf. This is a two-certificate course designed to address our shared mission to help each other and the suicidal people we may meet on our journey through life. Some may be friends, some coworkers, and some may be the citizens we serve. As law enforcement officers or students-in-training you may have already experienced a completed suicide or a non-fatal suicide attempt in someone you know. Note: This not a train-the-trainer program. Our mission? Train you to prevent THE NEXT suicide attempt! As background to this building this course, the QPR Institute worked with noted law enforcement professionals to build a training program designed to meet the specific needs of those working in law enforcement and those planning a career in criminal justice. Model intervention videos were graciously contributed by members of the San Bernardino Sheriff’s Department, the Ontario Police Department, the California Highway Patrol, the S.B.S.D. Valley Control, and the Redlands Fire Department. Law enforcement professionals have been identified as "key gatekeepers" in the 2001 National Strategy for Suicide Prevention. Specific training has been recommended. This course addresses this expectation. Law enforcement professionals have a high degree of line-of-duty exposure to suicidal behaviors. They engage people attempting suicide and they are on scene after completed suicides. They also encounter people in the pre-attempt phase when, for example, a suicidal citizen is trying to provoke an officer to shoot him or her. While generally physically and mentally healthier than people working in other professions, law enforcement professionals have a high and stubborn rate of suicide. This training is designed to lower this rate and to prevent the suicide of law enforcement professionals and their loved ones. While perceived comfort and competence in conducting suicide interventions or dealing with suicide events varies considerably, many law enforcement professionals have not had specific suicide prevention training that would be beneficial to the health and safety of fellow employees or suicidal citizens. For some, Level 1 QPR training is covered in the first few modules (approximately two hours). This may be all the training required by the learner's employer, academy or college instructor. The only certificate earned in this shorter version of the course is the QPR Gatekeeper for Suicide Prevention Certificate, Law Enforcement Edition. Level 2 QPR training requires at least 6 hours of online training (an additional 4 hours). If the longer course is completed, participants earn the QPR for Law Enforcement Certificate in Suicide Prevention. Completing and passing the quizzes in these additional modules qualify the learner to print the QPR for Law Enforcement Certificate in Suicide Prevention. The price for the shorter or longer course is the same. We encourage all learners to complete the full course if possible. The final exam is a national 25-item test that few health care or mental health professionals can pass without completing this or a similar training program. The QPR Institute trains and licenses Certified QPR Instructors for those interested in teaching QPR face-to-face. Provide evidence-based suicide prevention and intervention training programs for a variety of professionals and for undergraduate, graduate and post-graduate students preparing for careers in the helping professions. As of this writing in the Spring of 2011, the Institute has trained more than 7,000 Certified Gatekeeper Instructors who have, in turn, trained more than one million gatekeepers worldwide. In addition, thousands of clinical healthcare providers have been trained in how to detect, assess, and manage suicidal consumers. If this sounds like an "army" of people helping to prevent suicide, it is. Now, with your help, we will create a new division in that army of educated, trained law enforcement professionals and people of goodwill to help prevent suicide around the globe. While expert opinion may differ as to what helper competencies are required to assist suicidal persons achieve the most beneficial outcomes, little controversy exists about the lack of qualified manpower to help the thousands of people who think about, attempt and sometimes die by suicide. Through this training, law enforcement can become a part of the solution. The course leader, Dr. Paul Quinnett, served as a consultant to more than 30 law enforcement agencies in the Pacific Inland Northwest for 25 years, and much of this course is based on his personal and professional experiences. We believe everyone has a role to play in preventing suicide and that law enforcement carries a great deal of this burden to protect and serve suicidal people. Since so many of the mentally ill are now living in our communities and, sadly, on our streets, law enforcement professionals often make the critical difference in whether or not suicide attempts and deaths occur. To reinforce and provide hands-on practice with the skills taught in this online training program a free, downloadable tool kit is available to qualified instructors to support this training in the classroom. This training is not a substitute for a college degree in counseling or other helping profession, nor can it provide the face-to-face supervised interaction in role-plays we recommend and which are included in the free training support package. This course also does not teach the formal suicide risk assessment skills recommended for mental health professionals, but does teach the same foundational knowledge about causes of suicidal behavior and the relationship of mental illness and substance abuse to suicide. This training program does teach law enforcement professionals how to detect, intervene, and initially assess acute suicide risk. Learner's are taught the same screening questions many hospital Emergency Departments use to ask about suicide, and how to interview suicidal people, what questions to ask, how to ask them, and what the answers to these questions mean in terms of deciding on level of immediate risk and next steps. This simple interview protocol is used by thousands of mental health professionals and part of the mission here is to get law enforcement and mental health providers "on the same page" when it comes to working with suicidal citizens. Finally, an initial assessment of suicide risk, and the degree of control required to minimize that risk, is essential to officer safety. Modularized in a rich mix of text, video, voice-over PowerPoint™ lectures, interactive practice sessions, and other state-of-the-art e-learning technologies, this training program includes specific law enforcement challenges and job-related information. Basic QPR Gatekeeper Training for Suicide Prevention: 90 minutes to 2 hours. 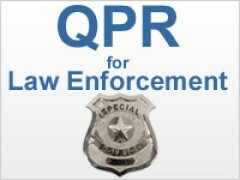 QPR for Law Enforcement Certificate in Suicide Prevention requires 6 to 8 hours, with final exam. If the learner passes this national exam, he or she will have demonstrated more knowledge about suicide and its prevention than a large majority of mental health professionals. Be familiar with the suicide-by-cop phenomenon and what common warning signs are present when a citizen attempts to provide an officer to kill him or her. The fee is the same for the QPR Gatekeeper Training for Suicide Prevention (shorter program) and the QPR for Law Enforcement Certificate in Suicide Prevention (longer program). When both sections are passed, the leaner is awarded two printable certificates. We won't kid you, passing the national exam is not easy.